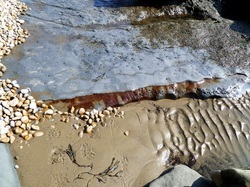 An outdoors, environmental movement workshop held on the shoreline near Charmouth and led by Sandra Reeve. ​How can we rediscover a sense of being part of the world we live in - rather than seeing the world as just ‘being there for us’? Can you perceive your movement as part of the shifting patterns of movement in nature? On the sand, under the cliffs or on broad, flat rocks by the sea, feel your elemental, embodied self responding to the land. All is in motion. How does your movement vocabulary change when you go from a room to the beach, to the rocks or to the sea? - when the sky becomes your ceiling and the horizon becomes your boundary wall? Changes in the weather, changes in your mood – all of this is movement. There will be a night-time movement session under the blue moon. This workshop includes an introduction to specific environmental movement dynamics, which can be used as training tools for outdoor and immersive movement skills: active/passive, proportions, transition/position and point-line-angle. The workshop (nearly all outdoors) is open to adults of all ages. You don’t need (and won’t be expected to have) any experience of Move into Life or other theatre/dance/movement work to attend this workshop. This workshop is popular with performers, teachers, therapists and health practitioners, and anyone interested in just moving/being on the shoreline. Venue: This workshop is run on the beach near Charmouth. You can combine this workshop with the 5 day Strata: Autobiographical Movement course which begins on Monday 23rd May. There is a reduced price of £350.00 for both workshops if you decide to do both and book before 25th March. ​To book a place on both workshops, click here. ​Save £10 if you book and send your deposit before 25th March. Very good value accommodation in self-catering cottages (single and twin rooms) may be available - let me know as soon as possible if you are interested.